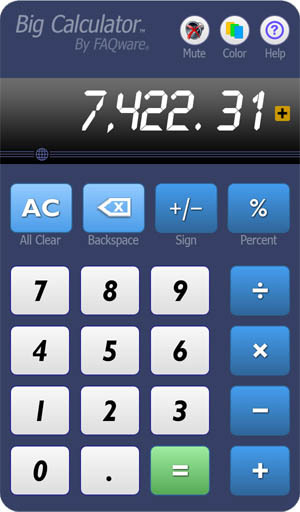 Big Calculator is perfect for balancing checkbook, school work and more. Simply the easiest calculator to use. 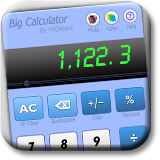 Designed specifically for tablets and phones, Big Calculator uses the whole screen so it has big buttons, big numbers and a big display area. No glasses needed to use this calculator! And Big Calculator comes with special features for better visuals and audible feedback. Ideal for children, teens, adults, or those with special needs. Big Calculator features all the basic operations such as addition, subtraction, multiplication, and division, as well as percentage. Big Calculator also makes it easy to spot errors with its big display. Correct problems with the backspace button. Displays 8 digit precision with commas and a math operation indicator in amber next to the number you are entering. This helps you keep track of what you are doing. Our family of calculators all come with unique built-in advice popups and helpful tips. Popup messages explain the correct way to do things if you are in doubt. Change the look of the calculator to suit your preference and pick your favorite color background with a tap on the Color button. We offer 8 choices that includes two high contrast themes for those with contrast sensitivity loss. Big Calculator also offers optional button press confirmation sounds. The 6 sound effects help distinguish between errors, operation keys, keypad keys, and others. Simplify your life and add Big Calculator to your device! We also offer Calculator Pro with Undo and History Tape designed for advanced device users who need more features. Personalize Big Calculator the way you want it! For style, set the background to one of 8 colorful choices including ice-blue, deep sky-blue, pistachio-green, amber-gold, orchid, violet, navy-blue, or dark-grey. Our ice-blue and dark-gray choices are further optimized with high-contract visuals including white-on-black numbers display and high-contrast hint text. To enable or disable key-press click sound effects, tap the Mute button.